⊿⊿ This necklace features a beautiful genuine raw crystal quartz pendant that is rimmed in gold plating and it hangs from a dazzling rosary chain plated in 24 karat gold that features delicate wire wrapping. The necklace does not have a closure, so you can place it directly over your head when wearing. One style features genuine aqua chalcedony and the other genuine moonstone in colors of light coral, smokey white and gray (actual color will vary from the colors on your screen). ⊿⊿ I have several of these available. Refer to the last images and make your selection at check out. The quartz pendants are about 2" in length and each is unique and one of a kind and will feature natural variations/cracks/fissures/imperfections - all organic to the raw cut of the stone. There are two lengths available. One is 26" in length with a 2" drop directly above the pendant and the other is 29" in length with a 2" drop directly above the pendant. 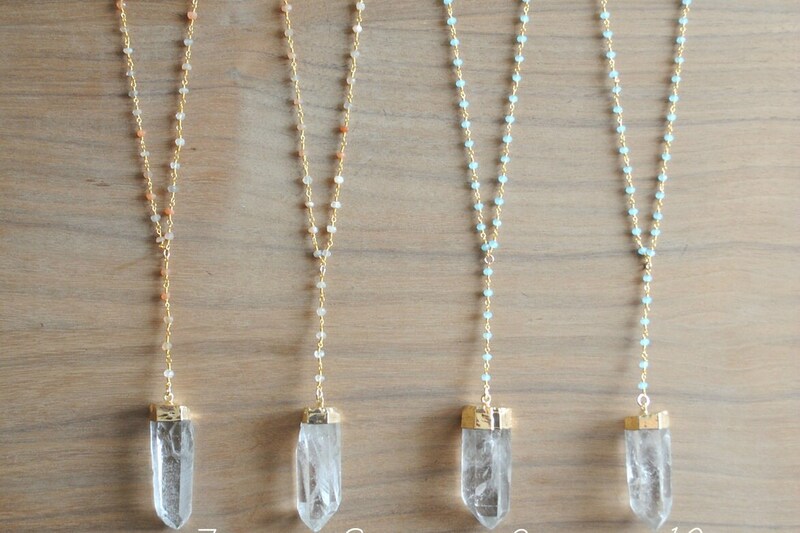 ⊿⊿ Quartz is known for many metaphysical properties, such as promoting power, energy and clarity. A great way to cleanse your stone in order to promote positive energy is to burn sage and let the smoke pass over your stone. You can also recharge your stone by leaving it in the sunlight for about four hours. ZOOM ⊿⊿ Use the zoom feature to get a closer look at item images. Beautiful necklace!! I put it on a different gold chain that I like better and got several compliments in the first few hours I had it on. Exactly like the picture. Nice size. Very satisfied. Just not as colorful as I thought unless direct sunlight strikes. Well made. Very cute! Exactly as pictured & shipped quickly. Druzy Ring - Agate Druze Gold Plated Ring. Adjustable Druzy Ring. Druse. Crystal Ring. Payment can be made using Etsy's Direct Checkout using a credit card. California residents will be charged state sales tax on all purchases. I hope that you are happy with your purchase, but if you are not I do accept returns as long as the item has not been worn and is undamaged (on all items EXCEPT EARRINGS for hygiene reasons). The item must be returned within 7 days of receiving it. Return shipping fees are the responsibility of the buyer and once the item has been received in the same condition as when it was sent out, I will issue a refund for the purchase price of the item or items (initial shipping fees are non-refundable). BEFORE RETURNING PLEASE READ: It is the buyer's responsibility to contact me if they would like to return an item. If there is a need, it is up to my discretion to request a photograph before an item is returned to ensure that it is undamaged/unaltered/unworn, etc.... All returns must be mailed with traceable tracking and the buyer must provide proof of this tracking (a link or a tracking number). Although rings are adjustable, they may not accommodate the smallest or largest of sizes, so please read the item description carefully before ordering to get a good idea of measurements, sizes, and colors. Please note that the colors that appear on your screen may vary from actual colors of the items. For necklaces please note that if there is a reference guide given to length size, this is only a reference. Body type, size, length of torso, proportions, etc.... will and do vary individually. If you have any problem whatsoever with your order or any questions before ordering, please contact me and I will be more than happy to assist you. My number one priority is a happy customer. Your item will ship 2 to 4 days after payment has been made. Shipping usually takes 3 to 5 business days when shipping to the United States, and the time frame can be from 1 to 2 weeks or more for international orders. Your purchase will ship to the address you specify at the time of check out on Etsy, please make sure it is correct. If you would like to add insurance to your order, you can upgrade your shipping at the time of check out, otherwise I do not offer refunds for lost or damaged items in most cases, but please contact me as soon as possible if something does arrive damaged or does not arrive. Take pictures of any damaged items and send them to me within 24 hours of receipt as your satisfaction is of utmost importance to me. Where does agate come from? Most agates occur as geodes which are formed in volcanic lava which contain gas bubbles that fill with siliceous matter. Variations in this matter (such as water), or the conditions under which the deposit occurs, can cause corresponding variations in the layers, so you will see bands of chalcedony that alternate with layers of quartz.The natural color of agate is usually gray, red, or brown. Any other colors are dyed agate. What does silver plated mean? Silver plating is when a thin deposit of silver is applied to the surface of a different metal base. Often it is also lacquered or sealed after plating to further coat the plating and base metal. What does gold plated mean? Gold plating is when a thin deposit of actual gold is applied to the surface of a different metal base. Often it is also lacquered or sealed after plating to further coat the plating and base metal. What does solid sterling silver mean? These bands are made of recycled and reclaimed solid sterling silver in a width of 16 gauge. Pretty strong, but still pliable enough to adjust the ring size. Gold fill means that a solid layer of gold is adhered to a base metal using heat and pressure and gold-filled pieces are 50 to 100,000 times thicker than regular gold plated pieces. They are basically the next best thing to 14K solid gold and are nickel free and hypoallergenic. They will not rub-off, tarnish or discolor your skin and are not the same thing as gold-plated or gold-tone pieces. What does gold leaf mean? Are your items nickel and lead free? Will a ring turn my fingers green? It shouldn’t! The base metal for the rings that are plated in sterling silver or gold is nickel and lead free brass. Usually if a metal has nickel, it will tarnish or turn green with time, and the “safest” base metals are platinum, gold, sterling silver and brass. All jewelry eventually tarnishes with time, but plating delays this process and preserves the metal’s shine while giving it a silver or gold finish. The best way to delay any tarnishing is to keep your ring away from water, cleaners, lotion and keep it clean and dry at all times. Please let me know of your positive experience. If you feel that you cannot leave positive feedback, please contact me ahead of time so that I may have an opportunity to assess the situation as your satisfaction is my number one priority. Thank you. All logos, text and photography associated with Gossamer & Violet are property of and Copyright ©2013- gossamerandviolet.